Notifications appear (as pop-ups in the lower-right corner) according to your subscriptions. 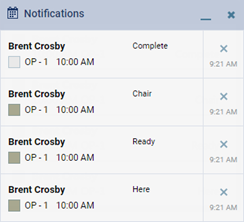 However, even if you are subscribed to a notification, a notification appears only if you are logged in to Dentrix Ascend at the time the change that triggers that notification to be sent to you is made by another user. Notifications are visible until you dismiss them or log out. Note: A sound accompanies a notification that you receive if your notification settings have been set up to allow a sound to be played. For you to hear the sound, your computer must have speakers attached and the volume properly set. To dismiss an individual notification and view the corresponding patient's appointment card on the routing panel, click (or tap) the notification text. Additionally, the corresponding patient's record becomes the selected patient in Dentrix Ascend (the Patient Search box, the patient ribbon, and, if you are viewing a page of any other patient's record, the current page are updated). To dismiss an individual notification, click (or tap) the Close button to the right of the notification text. To dismiss all your notifications at once, click (or tap) the Close All button on the Notifications title bar. To minimize (temporarily hide) all your notifications, click (or tap) the Minimize button on the Notifications title bar. When you want to view your notifications, click (or tap) the Restore button on the Notifications title bar.